Can I Lose My Retirement in a Bankruptcy? Social Security: Social security payments are safe in a bankruptcy case--at least until they’re deposited into your bank account. In some states, cash in bank accounts is not exempted. It is therefore wise to keep your social security deposits in separate accounts that commingle them with other funds, to make them harder to trace. Pensions: Private company pensions are protected if they qualify under the Employment Retirement Income Security Act of 1974 (ERISA). To qualify, these plans must meet certain requirements contained in ERISA and the Internal Revenue Code. While pensions from governments, churches, non-profit organizations, certain partnerships and tax exempt organizations are not ERISA qualified, they may still be exempt, if they meet other Internal Revenue Code requirements. 401(k) Accounts: These investment accounts are protected under Section 401(k) of the Internal Revenue Code. Traditional IRAs and Roth IRAs: Currently, you can protect a total of $1,283,025 in traditional or Roth IRAs. This IRA exemption maximum has gone up every three years, and will spike again in late 2019. Annuities: The Internal Revenue Code protects some annuities, depending on how the annuity was funded and its payment conditions. For example: an annuity set up to pay lottery winnings will not be exempt, but one that starts paying you when you turn 65 will be protected. Will a Reverse Mortgage Help? Reverse mortgages are designed to let you access your equity, without leaving your home. In exchange for either monthly payments, lump sum payments or lines of credit, you agree to relinquish your house to the lender, once you pass away or permanently move away from it. You must consult your state and federal exemption guidelines to determine if the equity in your home is protected. Some states allow you to protect 100% of the equity, but most states limit the amount. Is the Lake Lot Safe? This piece of property is difficult to protect, because it won’t qualify for a homestead exemption, like your house does. Therefore it will only be protected if your state exemptions categorically cover it. Under federal exemptions, a "wild card" category protects anything up to a value of $1,250 (adjusted every three years), plus up to $11,850 of any unused homestead exemption. But since you’re already presumably using all of your federal homestead exemption, that extra amount won’t be available to you. Can You Protect the Real Estate Equity Another Way? There are other ways to protect the equity on your home or the lot. But these methods are tricky and can backfire. The Hard Way: You could possibly take out a mortgage on the property or sell the lots, then deposit the proceeds into your 401(k) or IRA, which are protected accounts. However, you must disclose most of your financial transactions for the previous one to two years, when you file your bankruptcy case. The court will scrutinize those transactions, and if appears that you converted nonexempt assets to exempt assets--solely to keep the money from your creditors (an action called "impermissible pre-bankruptcy planning"), the bankruptcy court could squash your effort, by forcing you to use the money to pay your creditors, anyway. The Better Way: Suppose you have a burdensome $50,000 credit card debt. If you filed a bankruptcy case, in all likelihood, the court would want to turn over enough property, to pay that debt. But there’s a silver lining. Even though you owe $50,000, that doesn’t mean that you’ll pay that entire amount. Because before they're paid, creditors must file claims, which must follow certain requirements, or the trustee appointed by the court to administer your case can object to the claim and possibly have it thrown out. Other creditors won't bother to file a claim. And any claim that isn’t filed or allowed by the court, will consequently be discharged. Therefore, there’s a solid chance you'd have to pay less than $50,000 in debt. But you still must give up your house, which the trustee would then sell, in order to pay you the full amount of your allowed exemption, the costs of the sale, the trustee's own commission and all the allowed claims. The court will then refund to you anything left over. Alternatively, you could offer to substitute other nonexempt properties or cash, to preserve your house and most of your equity in it. Most likely, you’d borrow against your equity, either with a reverse mortgage or a home equity line of credit. 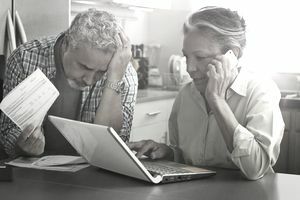 Instead of taking on more debt to turn equity into exempt property, some individuals consider using their 401(k)s and IRAs to pay off other debt. But this is widely viewed as a terrible idea, because it entails using protected money to pay debts that could be eliminated by filing a bankruptcy case. Furthermore, withdrawing funds from your 401(k) or your IRA before you turn 59 and a half, triggers significant tax consequences. Before taking any action, consult a knowledgeable consumer bankruptcy attorney, to obtain a deep dive understanding of these transactions. They often take careful planning and timing in order to satisfy the bankruptcy court's many complex requirements. Just How Bad is Bankruptcy for Your Credit Score? Can Bankruptcy Help You Be a Better Money Manager? Are You Avoiding Bankruptcy Because of Stigma?